Please join Kol Ami for our 2nd-night Passover Seder! This event is free and welcoming to all. Bring: Kosher-for-Passover (no chametz) vegetarian dish to share with serving utensils and a bottle of wine or juice. Please contact Rabbi Doug Alpert at dougalpert@kolamikc.com or 816-510-4895, with any questions about whether a dish or ingredient is okay. Please be aware of any allergens in your dish (peanut, dairy, etc.) and be prepared to indicate such when you arrive at the Seder. Please RSVP by April 8th to reserve your spot and sign up for a dish. Parking: Please allow time to find parking; there is only street parking available. Consider donating to this event. 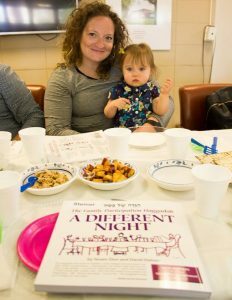 Your generosity helps those who would otherwise not be able to attend a Seder. Wondering how much to donate? It costs Kol Ami approximately $10.00 per person or $60 per table to put on the 2nd Night Passover Seder. We very much appreciate your generosity. If you are available to assist with set-up, please be at Kansas City United Church of Christ by 3:30 PM. We can’t wait to see everyone and to celebrate Pesach together!